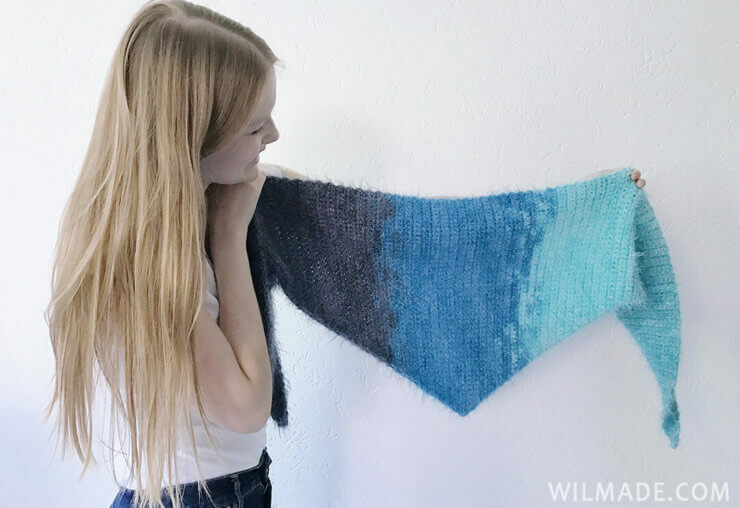 Stay warm and cozy this winter with this simple fluffy crochet shawl! 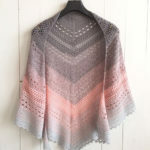 The It’s So Fluffy Shawl is made with single crochet stitches and increases on one side of the shawl. 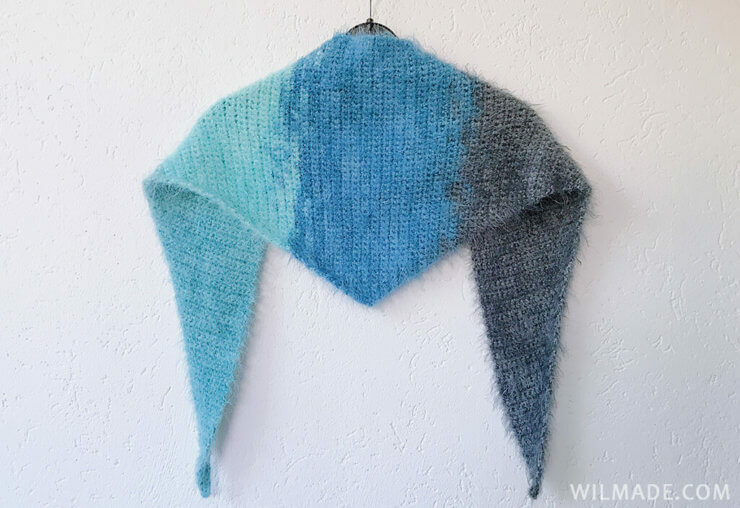 Very simple, but in combination with an amazing fluffy yarn, this shawl will be your favorite item this winter! One year ago I saw some amazing fluffy yarn and immediately fell in love. I knew I wanted to make a simple shawl with it. 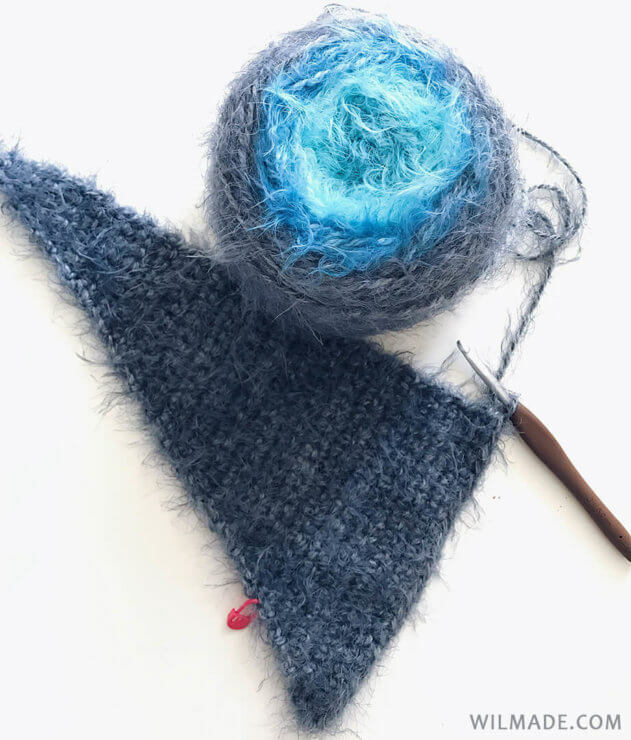 I decided to make a triangle shawl which has very long ends and isn’t too deep in the middle. As the yarn is very chunky, I’ve used a 6mm crochet hook. 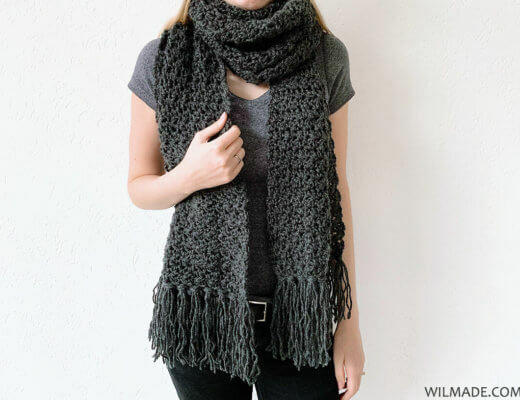 This fluffy crochet shawl keeps your neck very warm! 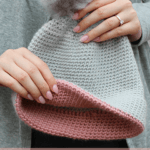 It’s a very simple design with single crochet stitches and increases on one side. 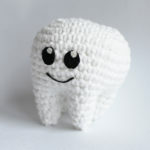 The yarn will do all the work: the fluffy material will make this simple design stand out and it works up pretty quick! The yarn that I used for this design is Lion Brand’s new LB Collection® Soft Spoken, a high fashion wool-blend yarn that combines two hot trends: faux fur and ombre stripe effects. Soft Spoken has excellent drape, luxurious softness and colorations that mimic hand-dyed yarns. 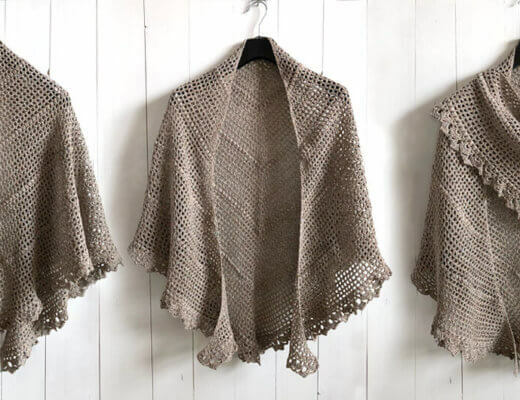 I only needed one cake to make a complete shawl. Place a stitch marker in the last stitch you made in row 3. Now all we have to do is make 1 sc in every stitch, and when we reach the side of the stitch marker, make 2sc in the last stitch. Repeat row 4 & 5 till row 95. You now have 50 stitches. 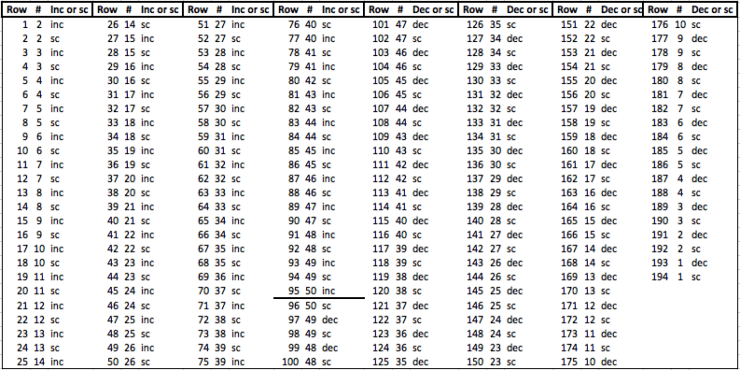 Repeat row 96 & 97 till row 191. There are 2 stitches left at the end of row 191. 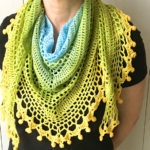 I would love to see the shawl you made! Don’t forget to share some pictures on Facebook and Instagram, you can tag me on Instagram with my username @wilmawestenberg. Add this pattern to your Ravelry queue here. 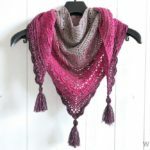 If you have any questions about this fluffy crochet shawl pattern or any of my other patterns, feel free to join my Facebook Group. I created this group for you to share pictures/ progress, ask questions and to help each other out.